Accessories | Shree Raj International Private Limited -SRIPL , Packaging, Supplier,Consumables, Tools, Equipment, Steel strap, Plastic Strap,Pet Strap, Container Lashing strap, Stretch Film, Shrink Film, Corner protector, Angle Board, Steel strapping tool Strapping Tool,Pet strap tool, Battery operated tool for pet strap,Box Strapping Machine, Shrink machine, Carton Taping Machine, Box wrapping machine, Pallet Wrapping Machine, And, in, Kolkata, Westbengal, Orissa, Assam, Guwahati, Jamshedpur, Bihar, Patna, Siliguri, Bhubaneswar, Cuttack, Jharkhand, Ranchi. SRIPL provides reliable and high performance accessories; they vastly improve productivity of plastic/steel strapping applications. 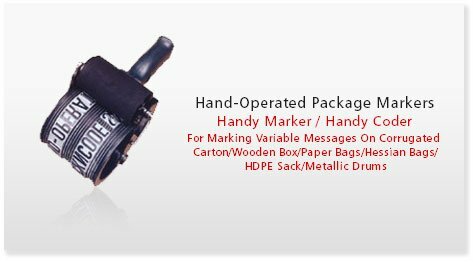 SRIPL having Coders like Hand Operated Package Markers, Auto Coders etc..
Sripl is having two types of Auto Coders. To mark variable information on Outer Packs on-line. Because of indexing, ensures single marking on individual packs while the pack moves. Does marking on Outer Packs while the Pack moves on the conveyor. To mark variable information/logo/monogram on Leather Cloth, Inner Layer Of Paper Tubes /Cones /Paper Reels, Plywood/Decorative Laminate, Paper Reels etc. Does on-line marking on Web, when Web moves. Made of rubber moulded to form grooved stereos. Permutable combination of stereos provided in one set, which can take variety of markings. Stereos of 6mm, 8mm, 14mm & 25mm height available as options. Composite stereo strips and logo/monogram can be provided on specific order for easy changeover of messages. Available in Black, Red ,Green & Blue colours in 1 Ltr. & 5 Ltrs. Pack. On stereos through non-messy specially formulated Ink Rollers are available in Black, Red, Green & Blue colours. Ink Rollers can be charged by immersing the same for 30 Minutes inside a lidded container. 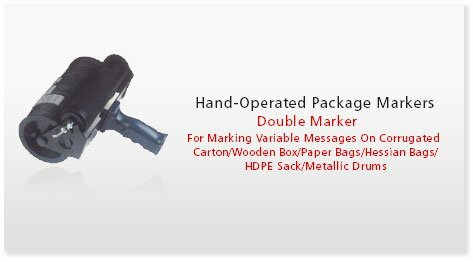 SRIPL’s is having hand operated package markers for Mark Variable Information Like Batch No., Date Of Manufacturing, Exp. Date, Name & Address Of Consignor /Consignee, Product Name/Code Shipping Marks, Nett Weight /Gross Weight etc. On Porous (Absorbent) & Non-Porous (Non-Absorbent) Surfaces. 100% value addition to Transport Package. 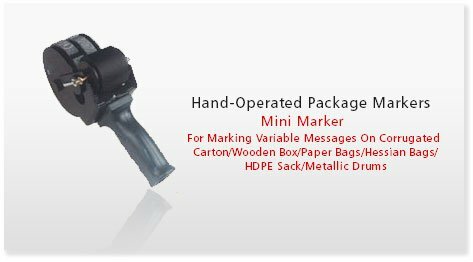 Eliminates Stenciling, Handwriting, Hand Stamping, Screen Printing & Preprinting (to large extent). Enormous saving compared to Stenciling, Screen Printing & Preprinting. Marks variable messages in 1.5 Seconds Flat in a clear + legible + in a print-like manner. Cost Per Print Of Three Lines – 1.5 Paise to 2 Paise. On stereos through non-messy specially formulated Ink Rollers are available in Black, Red, Green & Blue colours in 1 Ltr. & 5 Ltrs. Pack. 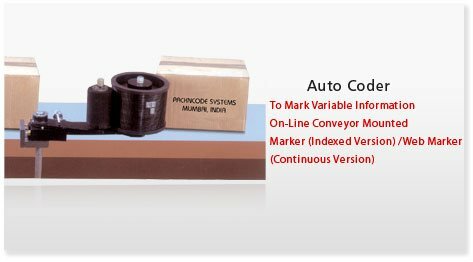 Ensures even pressure on rubber stereos, thus ensures clear/accurate marking. Ensures even contact with the stereos on the marker, thus ensuring clear /accurate marking. Made of high impact plastic, the profile of the handle has been specifically designed to suit long man-hours of use. Within 30 Minutes of practice, any person can operate Hand-Operated Markers with ease. 100% user friendly as compared to Stenciling, Handwriting, Hand Stamping &, Screen Printing.